So yesterday I showed you how I made Dakota's jeans last a little longer. 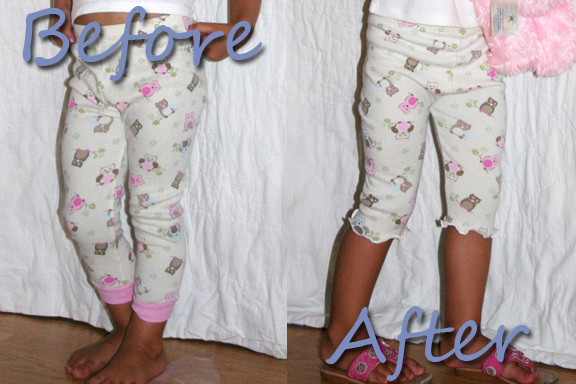 Today I'll show you ﻿how I make Aiyanna's pajamas last a longer. As you can see these pajama pants are too short. But what else would you expect when a tall 3 year old is wearing a 2t. What you can't tell in this picture is that they are also too tight from the bottom to just a little below her knees. It took me just 5 minutes to make them last a little longer. First thing I did was cut one leg off to just a little below the knees. Fold them in half making sure the waistband is even. Now cut the second leg. Next I sewed a rolled hem using the serger. Stretch the fabric as you sew to give it the lettuce edge. Here is what the hem will look like. We need to take care of the thread tail so grab a needle. Insert the needle into the rolled hem and thread the tail through the eye. Pull it through the hem. Now you can cut off any excess. You can make shorts using the same technique. So cute! Too bad my little boy would look silly with a ruffly edge. Someday I will have a cute little girl to make frills pjs for. Thanks for linking up with DIY under $5!